Something that could not reasonably be done under ASP without a third party component was the uploading of files to the web server even though the uses of this feature range from content management systems to online cost estimates for translations (based on the content of uploaded files). Of course, these are only two of many uses . 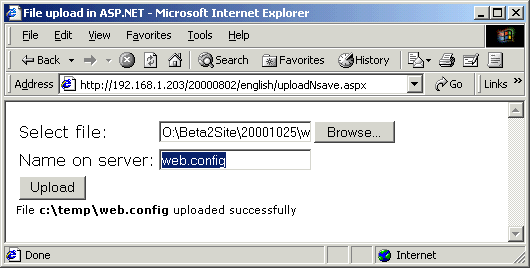 As mentioned, under ASP third party components are necessary to be able to receive files on the web server. 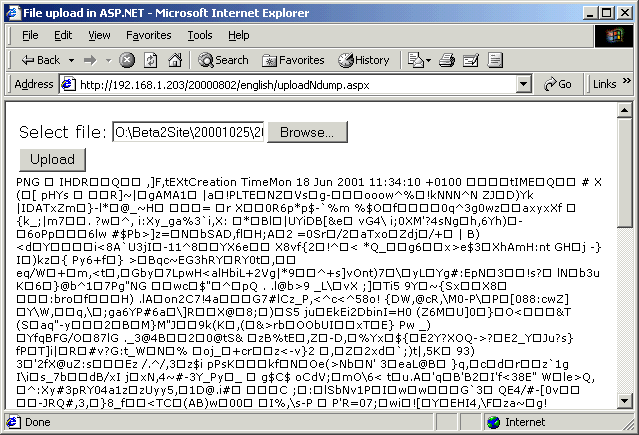 ASP.NET offers this functionality by means of a HTML Control called HtmlInputFile which roughly speaking only differs from the known INPUT TYPE=FILE in its RUNAT=SERVER Tag. But it is an integral part of the product, manages the upload for you, and on the browser side behaves like the normal control you already know. The first approach is the simplest solution, the second demonstrates a very flexible concept for receiving the data yourself and processing them. To begin with we just look at the form for sending the file to the server (and setting the name it is to have on the server). As we send mixed data, the enctype is set to multipart/form-data. This isn’t anything new yet. The only hint at ASP.NET is the fact that the form is run at the server (RUNAT=SERVER). This isn’t the exact source code from the example, but only the ‘niceties’ for file naming on the server are left out – the upload works the same here. Now what happened? The if test checks whether a file was posted by testing the PostedFile property against null. If a file is being uploaded, this property contains a vaild reference to an object of the type HttpPostedFile, and thus is not null. After this safety check, all that is left to do is ‘merely’ saving the file – a simple call of the function SaveAs on the object HttpPostedFile does everything for us. Should something go wrong, our code will be notified by means of an exception. It is this easy to load a file onto the webserver in ASP.NET. The example code itself differs from this only in that the file can have a name chosen by the user. This makes it a bit longer, but already quite flexible. There is nothing barring the reuse and extension in your own projects. However nice and convenient the simple saving of the uploaded data into a file on the server may be, often you want to immediately continue working with the uploaded data (the bits) – without taking the detour through a file. Applications would be for example storing the data in a database, parsing the data or performing some other kind of processing. In this case too, ASP.NET and the .NET Framework do not leave us dangling. Instead of handing control over to the SaveAs function, one can gain immediate access to the stream of uploaded data and continue working with it – while the upload runs. The above screenshot shows that my source code (uploadNdump.aspx) also can correctly handle binary data. I achieve this through a forced conversion to ASCII. The details for this can be found in the source code and the following description. First I define a constant and then instantiate three variables needed for the processing of the stream data: a variable containing the number of bytes read, the buffer for the data read and the StringBuilder which is being used for saving the stream data which have been converted to ASCII. Now the action begins – first I fetch a reference to the Stream which is made available by the object HttpPostedFile (which in turn is available through the PostedFile property of the HtmlInputFile object). This way I avoid additional accesses to properties and foreign objects which would only add to the processing time. Then I read in the initial data and enter the while loop. There the data is converted to ASCII and the next data is read. The while loop breaks when no more data has arrived at the server. When the while loop is done, I have the data at my disposal as a string for further processing – instead of writing it back to the client I might as well parse the string – or write it to a database. The intended application dictates the further processing. By the way: if you want to use the unmodified binary data, you should avoid the conversion to ASCII and use the appropriate ‘intermediate storage’ – a large byte array, a MemoryStream or a self defined data structure.